To help facilitate understanding of my proposed study, various themes are written below overviewing data from this website and supporting journal articles. The data is presented below. ADAM33 shows increased expression in asthmatic patients during an attack. The data obtained from microarray experiments at GEO profiles was an important tool in understanding how ADAM33 protein is expressed in Asthmatic conditions. The data showed in response to allergenic triggers, such as ultrafine carbon particles, the level of ADAM33 increases. They also showed that ADAM33 showed a decreased level of expression in peripheral blood mononuclear cells of children with acute asthma during exacerbation. The data seems to indicate that while ADAM33 mRNA transcription increases during asthmatic attacks, it is not occurring in peripheral blood mononuclear cells. This information was further validated in a study by Susan C. Foley and her colleagues . They found that the ratio of ADAM33 copies in the cell were found to be much higher in patients with severe or moderate asthmatic conditions. These studies provide strong evidence that an increased transcription of ADAM33 occurs in patients suffering from asthmatic conditions. Protein interaction studies show interactions with the immune system response pathway. Transcription and expression of ADAM33 has been shown to increase with IL4, and indirectly inhibit IL2 proteins. These are both important proteins in determining if proliferating helper T cells differentiate into Type 1 or 2 helper T cells. The Il-4 protein is one of the major cytokines produced that promote the production Th2 cells, while IL2 proteins promote proliferation of Th1 cells . Due to the close association with IL4 and ADAM33 levels, it is likely that ADAM33 is associated in the pathway of promoting Th2 helper cell proliferation. A visualization of the IL-4 pathway was produced by Biocarta and can be seen in the disease pathway portion of this website. The association with ADAM33 in asthmatic conditions is not known, but has been hypothesized in several separate studies. Shipiro and Owen hypothesized that asthmatic conditions can be caused by either a loss of function or gain of function of the ADAM33 protein. If an ADAM33 mutation results in a decreased shedding of receptors, a patient will be more susceptible to an over-reaction response to allergens in the environment. If ADAM33 functions in increasing the shedding of cytokines and growth factors, mutations increasing this efficiency may also cause a hyperactive response to particles in the environment. 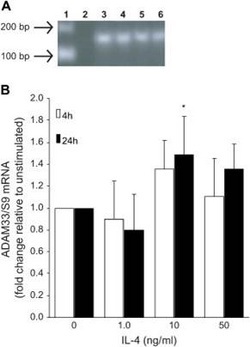 It is also possible that an increased transcription or decreased mRNA degradation may cause an increased number of ADAM33 receptors. 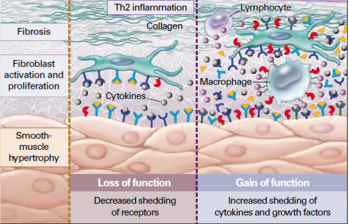 These result in Th2 inflammation, smooth muscle hypertrophy, and fibroblast activation and proliferation. All of which increase inflammation in the airway and airflow obstruction. It is possible that ADAM33 mutations in either of these categories are causing asthmatic responses. To help facilitate research, model organisms are often used. The phylogeny of the ADAM33 gene was analyzed by looking at the differences in gene identity and the percentage of amino acids conserved in the ADAM33 gene between several organisms. Shown above is an overview of the mouse and ADAM33 protein produced by Smart . The genes contain approximately a 78.4% gene identity, and share nearly identical domains. Smart shows a different location of the transmembrane domain, but this was not found by other protein domain sites listed online. The conserved regions towards the C terminus of the protein along with the genes overall homology make this a good organism for testing ADAM33. Mice also share a similar protein network to humans. The Il4 protein binds to Il13 and activates ADAM33 transcription, in what appears to be a similar manner as in humans. Although studies with mice have not shown linkage of ADAM33 to PHF11 which inhibits Il2, further studies may show a similar correlation in the mouse model.